You are going to Watch Naruto Shippuden Episode 293 English subbed online free episodes with HQ / high quality. Stream Anime Naruto Shippuden Episode 293 Online English sub Power – Episode 4. The Nine-Tailed Naruto clone tries to attack Dokku and the orphans, when Might Guy and Rock Lee arrive to repel it. 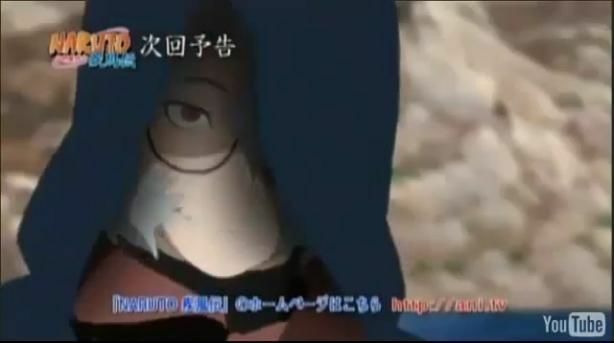 While they fight the beast, Kabuto tries to control it, but to no avail. The rest of Konoha 11 arrive. Team Asuma helps Sakura and Kakashi and Team Kurenai helps Naruto. Tenten and Neji arrive, but are cornered by the reincarnated puppets. Kakashi chases Kabuto. The beast grabs Naruto to absorb chakra, which the Nine-Tails gladly shares. Hinata tries to defend Naruto, but is sent flying. After the beast absorbs Naruto’s chakra, it grows in size and starts to devastate the Hachō Village, even firing a Tailed Beast Bomb in far away, missing Yamato, Sai, Deidara and Hidan who are fighting outside the village. Dokku tries to save Naruto, who is still unconscious. Moments before the beast tramples them, Kabuto summons a snake to swallow both of them alive and retreats.